I have a thing for big, hot, savory breakfasts. They’re what I look forward to every morning! First, my daily smoothie, then a big plate of something yummy – usually potatoes. Yesterday morning was no different. 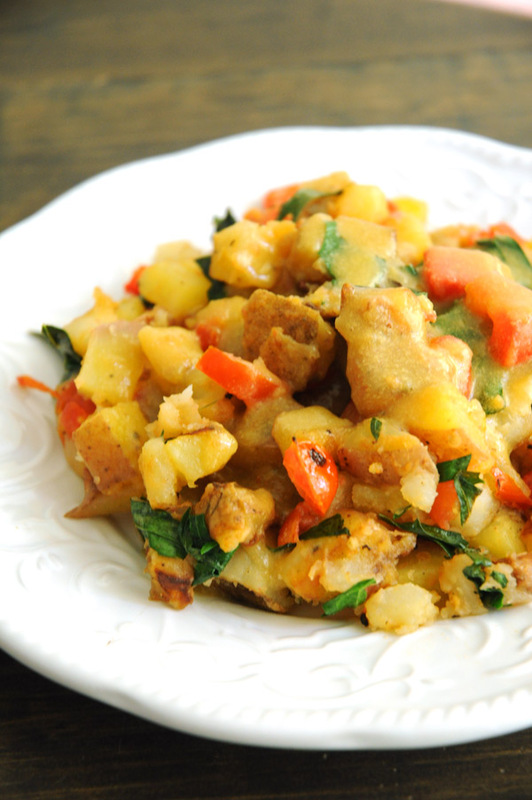 I woke up craving potatoes – but not my usual hash browns with veggies. No, I wanted something a bit more elaborate. 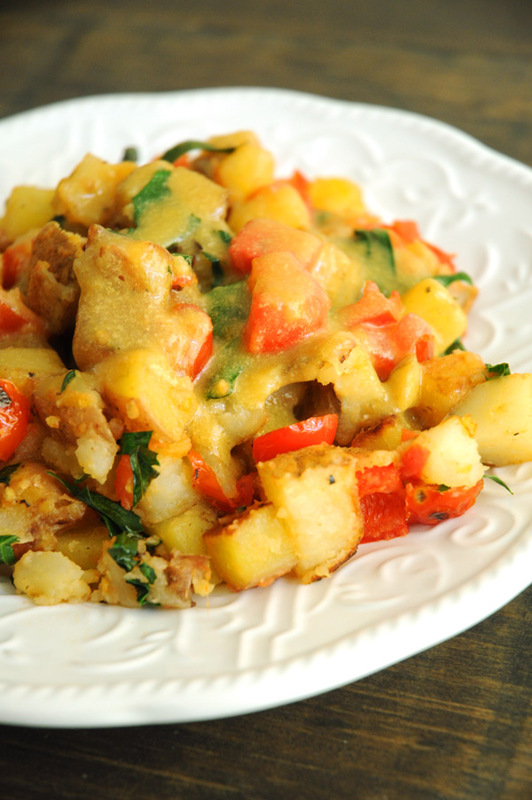 Enter – loaded breakfast potatoes (with some mushroom gravy inspiration from Jackie)! You know, I’ve never been a big fan of mushrooms, but I love them in vegan gravy. So when I saw a bunch of cremini mushrooms on sale this past weekend, I snatched them up, knowing that a pot of mushroom gravy was in my future. And what’s the best thing to do with gravy? Pour it over potatoes, of course! So, that’s just what I did with this breakfast dish. I suggest cooking the gravy first, then keeping it warm on the stove while you prepare your potatoes. Or you can cook them at the same time, if you’re good at multi-tasking! Use any ol’ greens you like in this dish – I used dandelion greens because I thought they’d work well, but I also think spinach, kale, arugula and even collards would be very tasty! 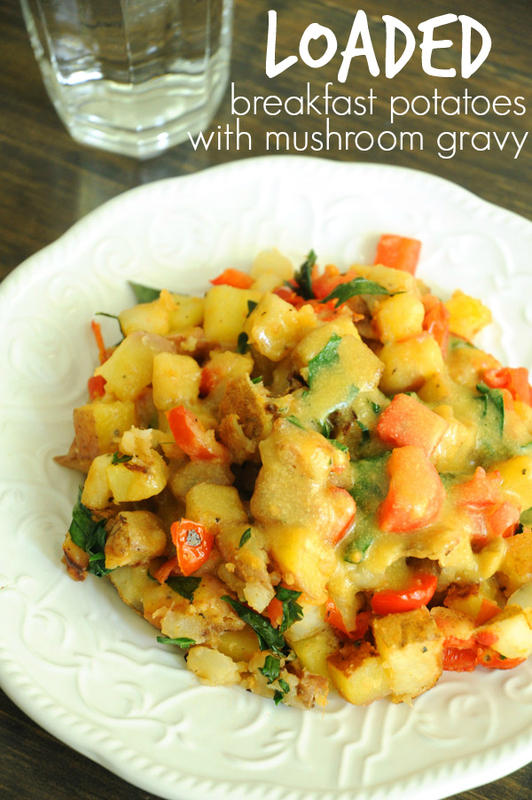 Pile your loaded potatoes on a plate and drown them in mushroom gravy. Then go ahead and stuff your face. It will be hard not to! Adapted from Vegan Yack Attack. In a small pot, add ¼ cup of your coconut milk, and bring it to a simmer over medium heat. Next, add the onion, saute for 2-3 minutes, then add in the garlic. Cook for another 2-3 minutes, or until the onions are slightly clear. Add the mushrooms and saute until they have darkened and reduced in size, about 7 minutes. Add the corn starch and mix it in very well. Add the rest of the coconut milk, the nutritional yeast and the tamari. Bring to a boil, then cook on low, stirring occasionally, until the gravy reaches the consistency you like (took about 5 minutes for me). 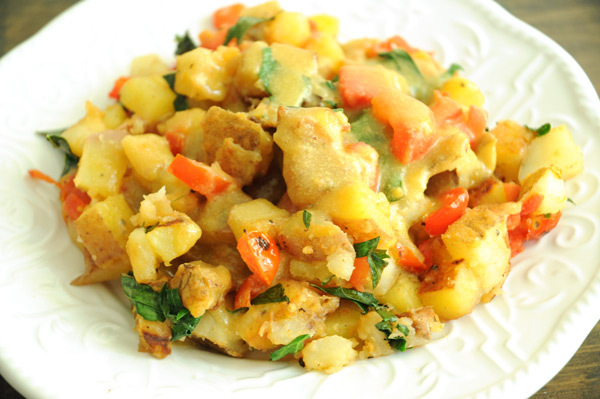 Season with salt & pepper and serve over your cooked potatoes. Heat olive oil in a large pan over medium heat. 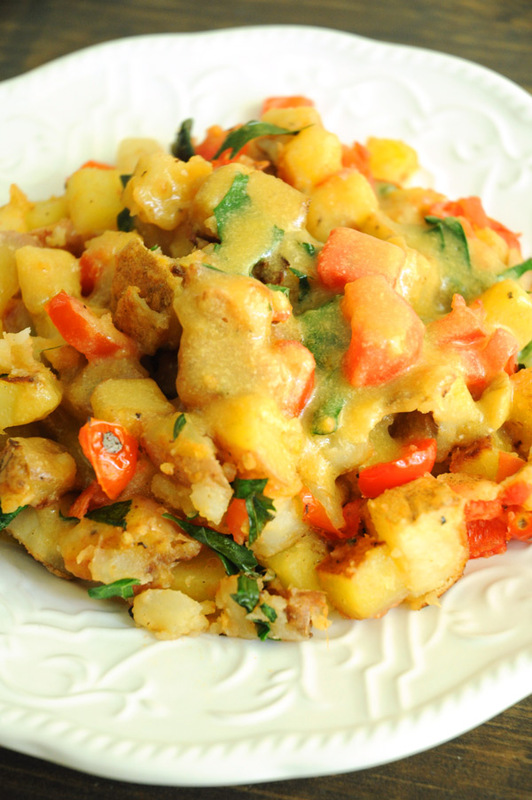 Once it's hot, add the potatoes, cover, and cook for about 12 minutes, stirring occasionally. Add the onions, and cook for about 5 minutes more. Add the tomatoes and bell pepper. Cook, uncovered, 5-10 minutes more, or until the potatoes are crispy and browned. Fold in the dandelion greens, and then season with salt and pepper. Thank you thank you thank you… made these for breakfast this morning and they were awesome!!! Didn’t have dandelion greens so used baby spinach. The mushroom gravy was fantastic. Thank you again for giving us another breakfast option. Holy non-cow moly. I have not made this yet, but I’m already drooling. The recipe indicates “3 large servings”. I am willing to bet that that translates into “1 serving for Jodi”. I cannot wait to try this! I made this last night for supper and we loved it!!! 🙂 Thanks! Now I’m usually a sweet breakfast kind of girl but these look seriously amazing. Mushroom gravy has been on my to-try list for too long given how much I like mushrooms, too, and it sounds perfect in this dish. Why in the world am I out of potatoes? I always seem to be out of potatoes at the worst possible time, too!